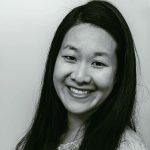 Published Apr 19, 2018 By Julia 2 CommentsThis post may contain affiliate links. A fast recipe for cooking artichokes in the microwave. 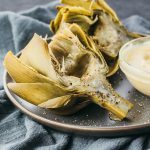 Includes a delicious garlic mayo dipping sauce plus instructions on how to select, prepare, and eat artichokes. It would be an understatement to say that I like artichokes. 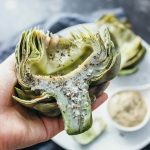 I’ve written about the best way to cook artichokes via boiling, then followed up with an alternate method that uses a pressure cooker to steam artichokes. 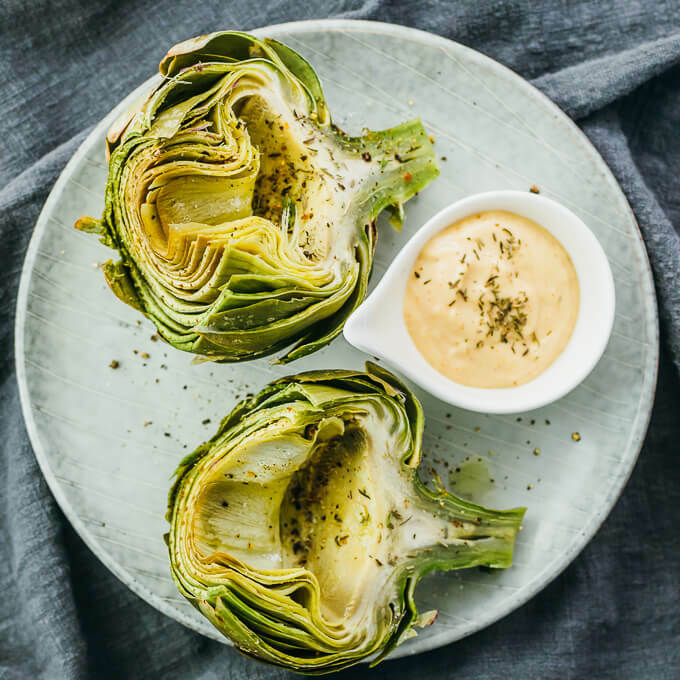 If that wasn’t enough, I also wrote a short tutorial on how to eat an artichoke for all of the artichoke novices out there and summarized my two favorite artichoke dipping sauces. I couldn’t stop there, so now I’m writing about the fastest way to cook an artichoke, accessible to everyone. You don’t need a pressure cooker and you don’t even need a stove. In fact, you don’t even need a kitchen. 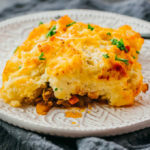 All you need is the humble microwave. Read on for more details! How do you select and prepare artichokes? Artichokes are in season from March to May, and that’s when you’ll find the best prices and quality at your local supermarket. They’re available year round at most places, but they’ll likely be sold at exorbitant prices and it’ll feel like highway robbery. Remember, you should be buying fresh, whole, raw artichokes in the produce section of a supermarket. Not anything sold in cans or pre-cooked. To select a quality artichoke, make sure that the leaves are all intact and tightly packed. If the leaves are opening and splaying out, then the artichoke isn’t very fresh. You also want to select an artichoke with a good amount of stem attached, at least 1 inch and ideally 2 inches. I also generally pick larger artichokes and not the smaller, scrawnier ones. Once you bring your artichokes home, store them unwashed in a produce bag in the fridge. Plan to use them within a few days. Start preparing the artichokes by rinsing them and snipping off obvious thorns. Slice off part of the stem, leaving an inch or so, and the top third of the artichoke that has inedible leaves. 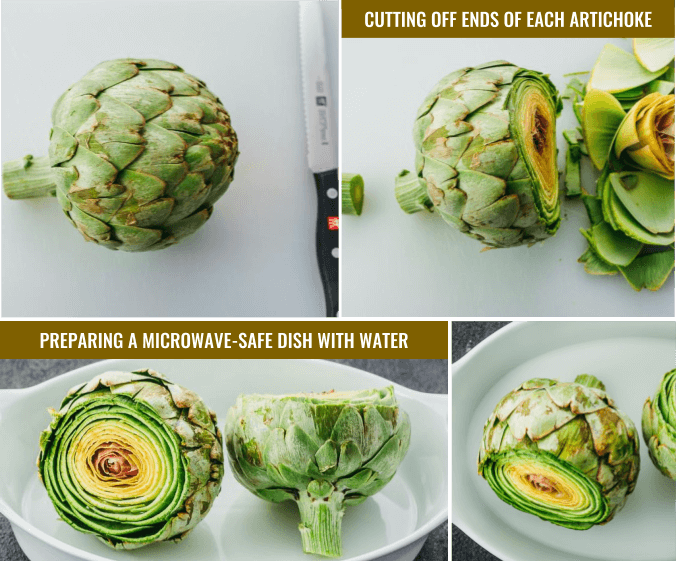 Place the trimmed artichokes on a microwave-safe dish with water, cover with plastic wrap, and you’re ready to cook them! How long do you steam artichokes in the microwave? Artichokes are cooked in a microwave by steaming — I add a small amount of water with the artichokes and cover with plastic wrap, so that the artichokes can steam until they’re tender. 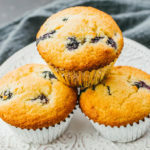 Microwaves can vary quite a bit, so you’ll have to be the judge of how long to cook them. Artichokes are done when an outer leaf pulls off easily, and a toothpick can be inserted into the stem with little resistance. It should be very tender. How do you eat an artichoke and what do you serve it with? Now comes the fun part, once the artichoke is cooked. To eat it, peel off a leaf and dip the fleshy part (that was closest to the stem) into the dipping sauce. Use your teeth to scrape off the “meat” of the leaf and discard the rest. Repeat until all the leaves have been accounted for. You’ll be left with the heart; this is the best part and should not be skipped — you can eat the entire tender heart. With some cooking methods (like boiling or pressure cooking), even the stem itself will be tender and can be eaten. My experience with microwaved artichokes is that the stem can be mostly eaten but some parts may not be tender enough. If you’re still confused, check out this tutorial with video and photos on how to eat artichokes. 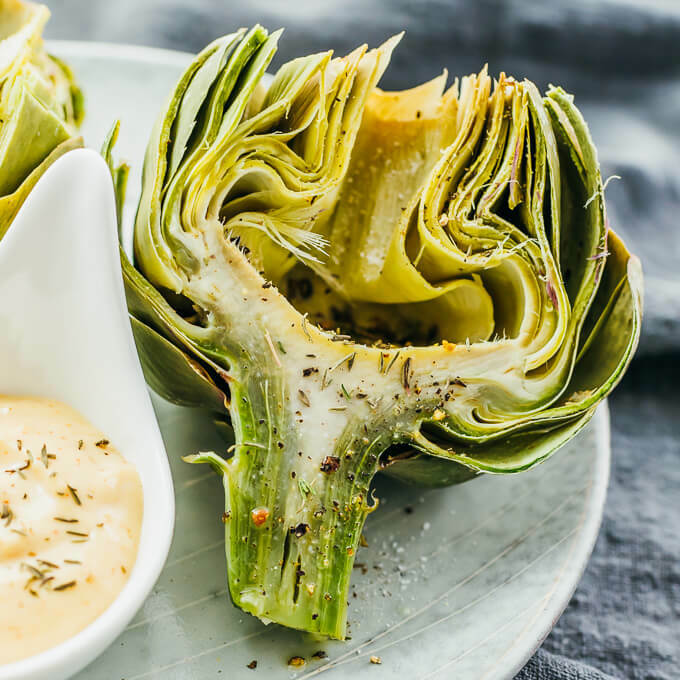 There are a variety of dipping sauces that go fantastically well with artichokes. In the recipe below, I share a mayonnaise based sauce with freshly minced garlic, cayenne powder, and Dijon mustard. For a simpler dip, you can combine melted butter with lemon juice and garlic. A fast recipe for cooking artichokes in the microwave. 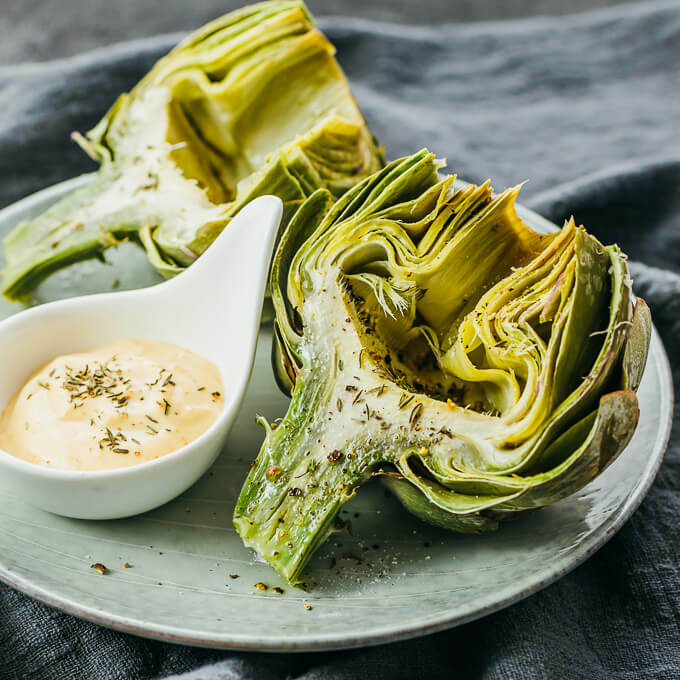 Includes a delicious garlic mayo dipping sauce plus instructions on selecting, preparing, and eating artichokes. Preparing the artichokes: Use a serrated knife to chop off the inedible top third of the artichoke. Also cut off most of the stem, leaving about an inch of stem. Microwaving the artichokes: Place the artichokes in a microwave-safe dish with 1/2 cup water. Cover with a lid or plastic wrap. Microwave on high for 8 minutes (small artichokes) or 9 minutes (mid to large artichokes). The artichokes are done when a leaf easily pulls off and a toothpick can be inserted into the stem with little resistance. If not done, microwave for another minute and test for doneness again. Set artichokes aside until cool enough to handle. Making the dipping sauce: While waiting for the artichokes to cool, combine and mix all of the dip ingredients until smooth. Serving: When the artichokes have cooled, slice each artichoke in half. Scoop out the white and purple centers and discard. 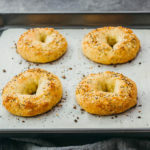 Brush with olive oil and sprinkle freshly ground black pepper, sea salt, and thyme over each exposed half. Serve with the dipping sauce. 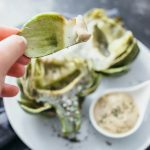 To eat the artichoke, peel off a leaf at a time, dip into the sauce, and use your teeth to scrape off the meat of the leaf. 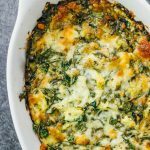 This recipe yields 6 g net carbs per serving (1 artichoke with dip). Well this is a new one for me! I would never have thought to cook artichokes in the microwave! I usually steam mine as opposed to boiling them so they don’t get water-logged, but I can’t wait to try your method! My dijonnaise-style mayo is exactly like yours!!!! i love all of your artichoke posts. this is way easier than my usual steaming method!